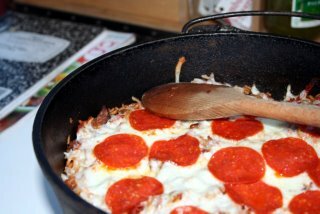 MarksBlackPot: Dutch Oven Recipes and Cooking: PizzaRice! But the idea just seemed so bizarre-ly cool that I had to try it. I originally saw it at the “Round the Chuck Box” blog, and here is the direct link. The picture below is his, but mine turned out looking pretty much the same. I just shortened the name from “Deep Dish Pizza Rice Entrée” to: “Pizzarice”. I did tweak the recipe a bit, too. I started by arranging a lot of briquettes under my 10” and a little less under my 8”. In the 8”, I put 2.5 cups of water, to heat or boil to dissolve a couple of chicken bullion cubes into. In the 10”, I crumbled the sausage and started cooking it. I like to use mild or medium sausage. I like hot sausage, but in dishes I’ve found that hot tends to overpower the rest of the flavors, and all you taste is sausage. In this case, I couldn’t find any medium, so I got mild. For Italian recipes, I like Italian sausage better than ordinary pork breakfast sausage. But use whatcha got. Once the sausage was cooked, I added the garlic and the onions and cooked those until they were translucent. By this time, the water was hot enough to dissolve the bullion cubes. So, I pulled the 10” off the coals and added the rice. I stirred it to coat the rice in oil. I don’t know why. The recipe said so. Maybe some of you know and can tell me why. Then I added the broth, the pesto sauce, and the pepperoni chips. Oops. I just realized I forgot the oregano. Oh, well, the recipe says you should add it at this point. Then, I stirred it all up. I set up the coals as above and put it on for about 20 minutes. At that point, I spread on the mozzarella (actually I bought a shredded blend of pizza cheeses, including provolone, romano, and parmesan as well as mozzarella), and I topped that with some more pepperoni rounds. Back on the coals for about another 10 minutes, and we’re good to go! Wow, that’s good! I’ve had a little trouble with rice dishes of late. This one is cooked perfectly. I think my troubles have been not enough liquid for the rice to absorb. 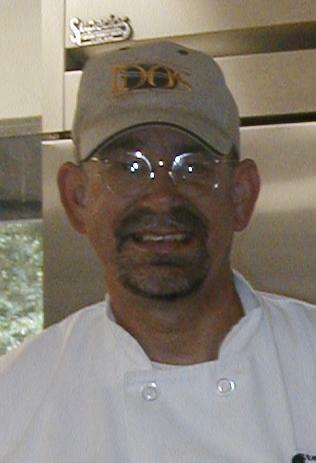 Nice looking picture -- I'm glad you liked the dish. I found the idea in one of my professional mags sometime last year. Thanks for the comment on my blog. I came over here and instantly my mouth was watering over this recipe. I can't wait to try it. Two New Recipes, One in the Wild! Two New, But Old, Ovens!